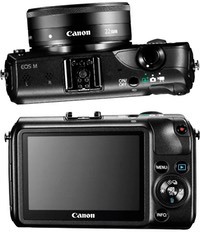 Canon today pre-announced the EOS M, their first mirrorless camera. The US$800 camera will be available in October. The EOS M is a curious design point. Basically it's a simple, shirt pocket, Powershot type of body in size and interface, but with the Rebel 4i (650D) sensor stuck inside and in front of a new EF-M lens mount. Sort of like a Toyota Scion with a V8 engine crammed inside. That makes for an odd conjunction. Canon's own positioning included this line: "...take-anywhere partner for a new breed of enthusiasts who chronicle their lives through images, without necessarily considering themselves to be ‘photographers’." With the EOS M we have true consumer-oriented UI and features coupled with state-of-the-art DSLR sensor. Quite a few commentators seem to tag this as not wanting to compete with or cannibalize with their own low-end DSLR line, but I'm not sure it's that simple. The EOS M feels more like a bridge to the Rebel line than the G1x, but the real question is there anything there that we really needed a bridge over? I'll come back to that after getting to the key features of the new product. As noted, at the heart is the 18mp APS sensor used in the latest Rebel, complete with phase detect autofocus sensors. Let's hope those perform better than they do for video in the Rebel, though, as few have been as impressed with Canon's on-sensor phase detect as have been with Nikon's (in the Nikon 1 models). Canon's been stamping out 18mp APS sensors for awhile now, so we all expect to see in the EOS M the same excellent image quality that we've seen in their Rebel series: really good high ISO performance, good dynamic range, even really good video performance. 18mp puts the EOS M squarely in the mix of the APS mirrorless cameras, which now range from 12mp (older GXR modules) to 24mp (NEX-7). Along with the EOS M, Canon presented two lenses and an adapter: the 22mm f/2, which is a modest wide angle pancake with macro abilities; the 18-55mm f/3.5-5.6, which works out to the usual 28-85mm equivalent kit zoom everyone seems to think they need to produce; and an EOS adapter so that you can use the EOS M with traditional DSLR lenses (EF mount). As with the other APS sensor mirrorless cameras, an 18-55mm mounted out front tends to dominate the small body, making for a slightly awkward combination. Like a NEX-3F with a kit zoom, it's sort of an "all lens" feel, which some don't like. The same is even more true for using existing DSLR lenses on the EOS M with the EF mount adapter. It seems to me that Canon is trying to build a temporary bridge here. An S100 user steps up to the EOS M because they don't want DSLR size but they want DSLR performance. Only once they're there and try a few DSLR lenses, the DSLRs start to look just fine. So what we really have here is a hot-rod compact camera: huge sensor in a small, simple body. 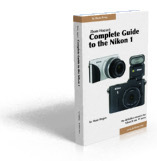 It's not an X-Pro1, OM-D EM-5, or NEX-7 competitor. But a GF5 with the 14mm lens is looking like it has a really strong competitor now, though at a much higher price. Yeah, about that price: US$800 with the pancake lens (implied body price is US$550, by the way). That leaves a lot of room for the competition to move around against. As usual, I've updated the camera, lens, and accessory databases with full information about these new entries.